A sequence is an ordered list of categorical values of a variable which, in the social sciences, corresponds to social processes or trajectories, such as school-to-work transitions or family formation. Sequence analysis presents the possibility of dealing with complex information because sequences are usually based on longitudinal data and cover a large number of cases. Even scholars who apply elaborated methodological statistical approaches necessarily need to reduce this complexity by restricting their analyses to certain events. For example, many researchers within the field of school-to-work transitions who apply event history analysis reduce the event “labour market entrance” to the status change into employment. 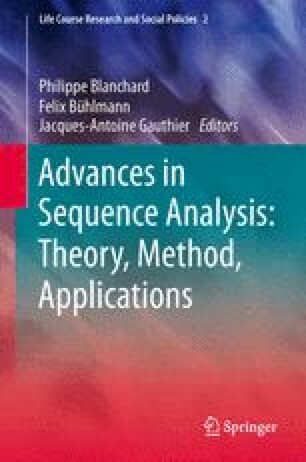 The algorithmic approach of sequence analysis has the ability to handle the complexity of social processes empirically. However, the problem of graphical representation persists because the use of categorical time series involving many individuals requires multidimensional visualisation, but the general form of (printed) scientific publications is still black and white. This article explores the different visualisation possibilities of sequential information that are typically used in the social science literature. It presents conventional (e.g., sequence index plots) as well as less common types of graphs (such as parallel coordinates plots, status proportion plots, and transition plots) and discusses their particular advantages and limitations. The arguments for this assessment are based on the particular scientific interest in certain features of sequences and on Cleveland’s rules of perception. Additionally, an attempt is made to find practical solutions to avoid problems in the depiction of sequential and transition data. This list contains a selection of graphing principles developed and assembled by Cleveland (1994). It is limited to those principles that are relevant for the graphs usually applied to sequence analyses. Make the data stand out & avoid superfluity. Use visually prominent graphical elements to show the data. Overlapping plotting symbols must be visually distinguishable. Superposed data sets must be readily visually assembled. Visual clarity must be preserved under reduction and reproduction. Put major conclusions into graphical form. A large amount of quantitative information can be packed into a small region. Graphing data should be an iterative, experimental process.